The origins of the term CUV (“crossover utility vehicle”) are a bit vague. According to one source, it was used to describe the market segment of some AMC/Jeep vehicles (Eagle, SX/4) as a rationale for Chrysler’s acquisition of AMC in 1987. But they were sedans/wagon bodies converted to all-wheel drive. In the modern parlance, a CUV is a multipurpose vehicle based on sedan underpinnings, but with its own completely unique body. 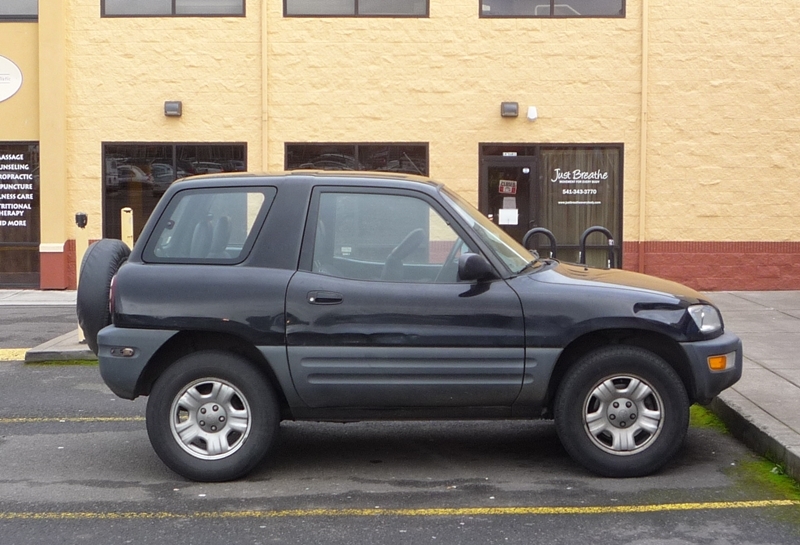 And in terms of kicking off the modern CUV explosion, the 1996 Toyota RAV4 gets the honors. 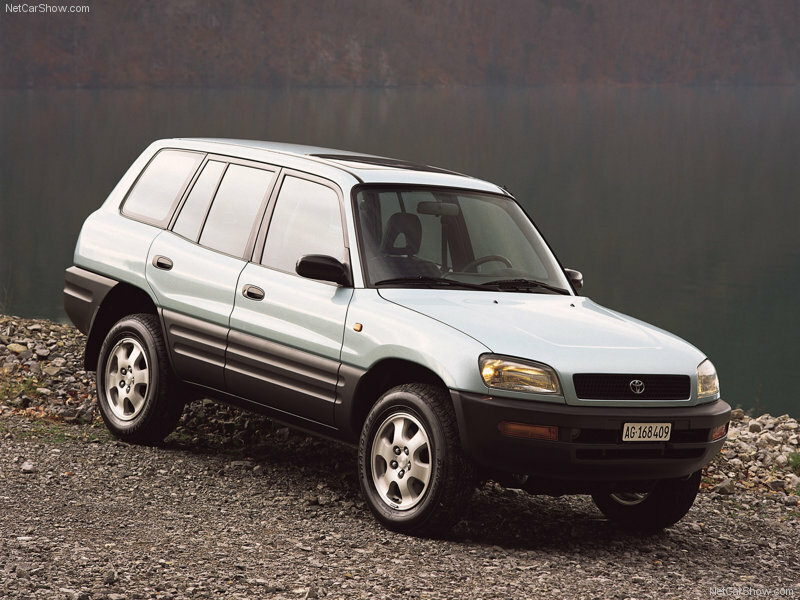 The RAV4, in both short and long-wheelbase form, was originally only sold in Japan, starting in 1994. US sales began in 1996. It sat on a modified Corolla platform, and was powered by the 2.0 L 3S-FE 16-valve four used in a variety of mid-sized Toyotas. In the original RAV4 version, it was rated at 120 hp. A minor facelift in 1998 brought a 127 hp version. The RAV4 also pioneered another category: the first CUV EV. Built specifically to meet California’s zero-emissions regs (later rescinded), it had a 27 kWh NiMH battery pack capable of some 120 miles range, in optimum conditions. Unlike GM’s EV-1, it was actually sold briefly to the public in 2002, and became the only vehicle of its kind on the roads until the modern generation of EVs came along recently. This one is shown with a “Long Ranger” gen-set trailer for extended trips. 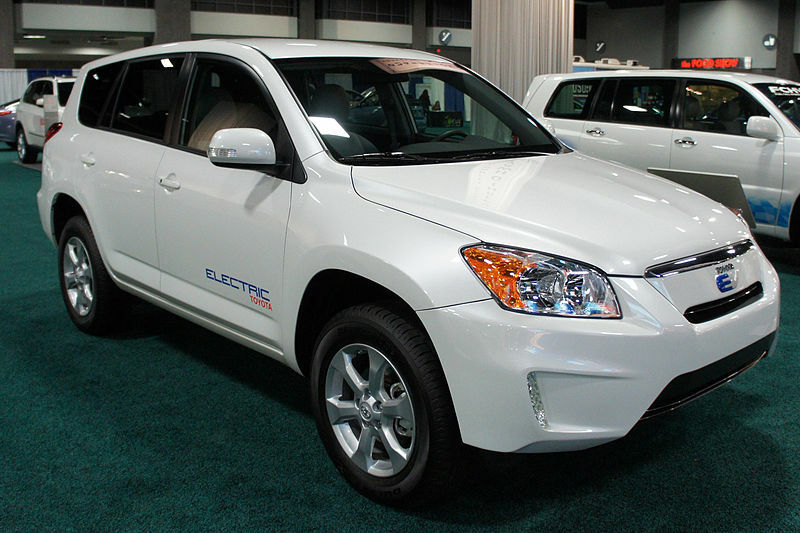 And the current RAV4 EV is reprising its pioneering role, as a product of Tesla and Toyota’s hookup. Now sporting a Tesla electric drive train with a useful battery capacity of 41-.8 kWh, the EPA has deemed its range at 103 miles. Priced at $49,800 before federal and state incentives, Toyota expects (hopes) to sell some 2600 per year in California only, once again to meet the zero-emissions regulations. While you’re not likely to find the EV version, the RAV4 continues to be one of the best sellers in the category that it pioneered, even if it has grown up along with the rest. What ever happened to shorties? I miss them. Did Toyota not crush all of it’s EV’s? No; they’re still on the road. And they were commanding very high resale prices until the Leaf came along. That’s because the electric RAV4s were essentially a regular RAV4 with an electric drivetrain. There were only 1000 EV-1s built and they were very advanced for their day so it would have cost GM more to support them than to crush them. Simple business decision. The other key difference I think is that Toyota sold some of their Rav4 EV while GM stuck to only leasing the EV-1s. So far the business decision holds, but why GM then refused to sell them when leaseholders asked seems less cut-and-dry. I’m not clear what the costs to GM of selling vehicles they intended to crush would have been? If GM would have sold them then they would have to have supported them with parts that were almost all unique to that vehicle. A few of the RAV4 were available for purchase from the get go but most were leased to fleets and a lot of those were quietly crushed upon lease end, but with the outcry of the EV1 leasees, they did offer some of the fleet returns for sale, rather than face the EV Jihad. I had all but forgotten that the 2dr existed until I parked next to one a few months ago. As I was pulling into the spot I didn’t realize it but once I got out I went hey that’s really short and only has 2drs. 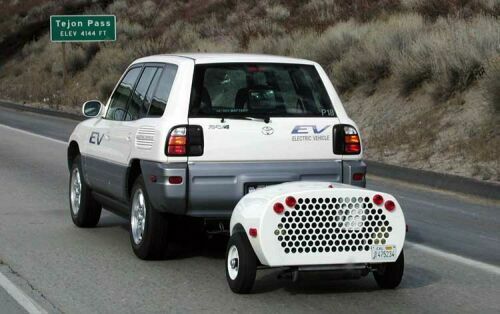 As far as the EV version they were never supposed to be sold, only leased but due to the flap generated by the EV-1 lessees Toyota decided to make them available for purchase when the leases were up. Ford did a similar thing with the Ranger EV though supposedly some of those that made it into the hands of eventual purchasers was due to dealers not using the special Ranger EV lease form that lacked the will not be available for purchase at end of lease clause. Also a fair number of the Ranger EV lessees reportedly refused to return them, but kept sending checks for the monthly payment. One of these day’s I’ll see if I can get some shots of the RAV-4 EV one of my acquaintances from my work with FIRST bought as a used vehicle in CA and brought it to WA when they moved up here. 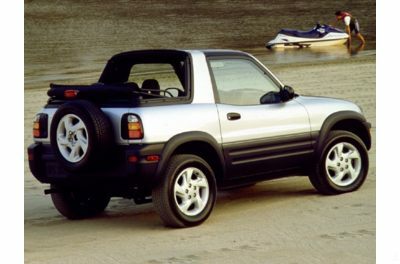 I remember the short Rav 4’s as they were pretty popular up this way, but never recall seeing much of the soft top version though. My boss at work has an early 4 door version, with well over 200K on it I think I heard him say. These things are all over, though the current EV version, I don’t like, that front clip looks like it has a severe under bite look about it. Toyota’s RAV-4 EV program ran from 1998 to 2003. 328 cars were built. 80 to 100 mile range, from a 27 kWh nickel metal hydride (NiMH) battery pack mounted across the bottom under the cabin. Some of these packs have lasted over 150k miles. NiMH is the same battery chemistry Toyota has used in the Prius since 2000. Toyota couldn’t have continued producing RAV-4 EVs after 2001 even if they’d wanted to. Ovonics, the NiMH battery technology developer and patent holder, was taken over by Chevron, who sued Panasonic and generally put a stop to production of large-scale NiMH packs for EVs. They let Panasonic keep making smaller packs for hybrids. After all, a Prius does burn Chevron’s gasoline. That’s not a conspiracy theory, it’s the historical fact, read all about it if you’re interested. Here’s Prof. 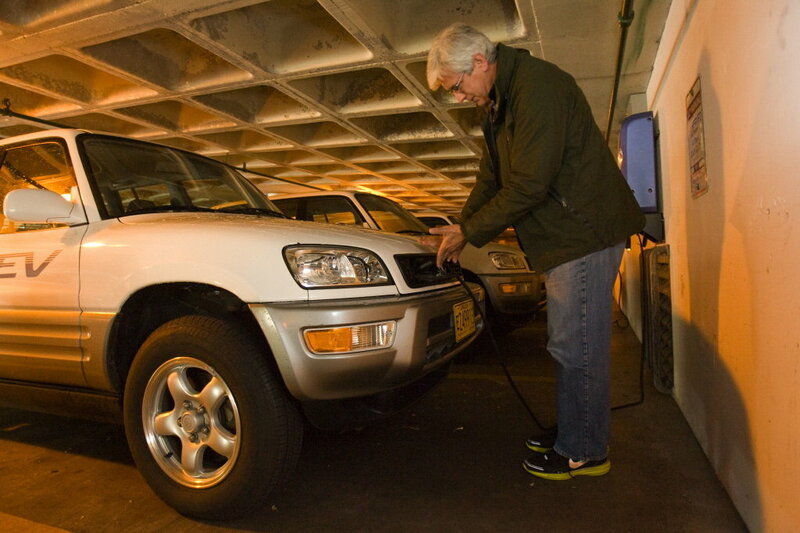 Beard plugging in one of PSU’s RAV-4 EVs, at the garage under the EE building. 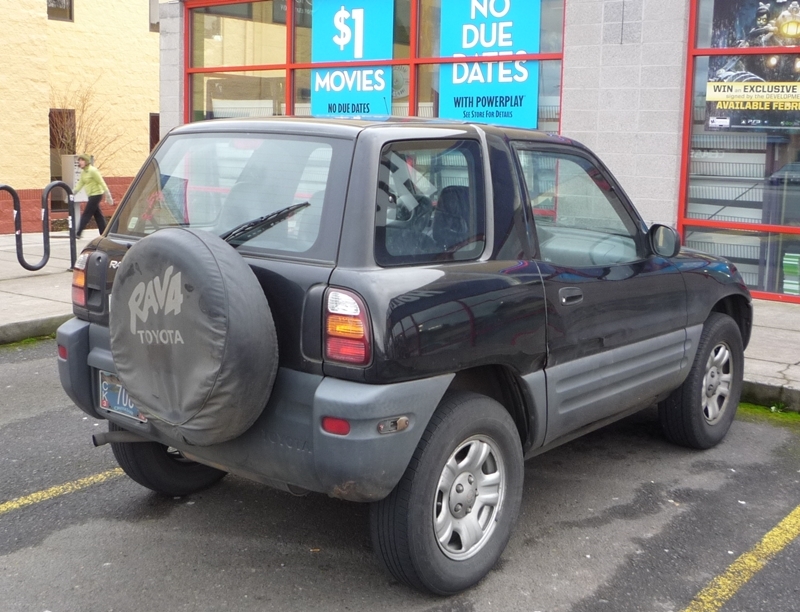 Never seen an electric Rav4 only the horrid Corona powered versions. Considering the number built and the fact that they were only available for lease in California when new it does not surprise me that you’ve never seen one. Is the current RAV4 Corolla based? No, it’s said to sit on a unique platform which, in many ways, may be Toyota’s best FWD platform. Although I think that there was a lot of component sharing between the RAV4 and the Caldina/Avensis/Premio/Allion/Scion tC as the first generation was based on the Celica/Carina/Corona-not the Corolla. These cars are currently the only FWD Toyota platform with rear double wishbone and, as in the past, are the only FWD Toyota platforms praised for coming anywhere close to being able qualify for the adjective agile. My friend had a 4-door one of these; in many ways it was WONDERFUL. 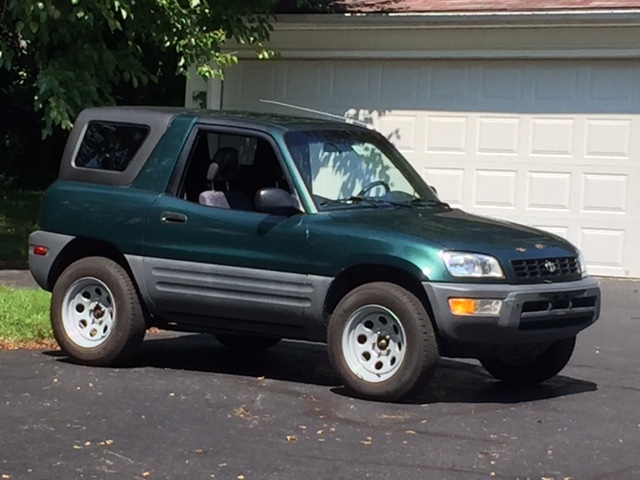 I generally dislike most lower priced Toyotas built after the very early ’90s, but the RAV4 is a lovely exception. Its stubby Land Cruiser shape and tall, cartoonish green house made a distinctive combination. There was a ton of cargo space with the rear seats put away, the sunroof was enormous and visibility from the driver’s seat bordered on panoptic which, in concert with the short wheel base, resulted in an incredibly nimble car in traffic. The ’87 Camry engine tied with very tall gear ratios through what felt like a very wasteful automatic gearbox made it irritatingly slow; probably about 13 seconds to 60, even without AWD. I doubt gas mileage was very good either. My friend’s car was 100% trouble free in every way, that is, until the engine grenaded with 180k miles on the clock. This in a rather well maintained car suggests its engine was less than robust. I have a pet theory that Toyota engines generally aren’t as durable as those in Hondas, despite superior performance in other aspects of vehicle reliability. 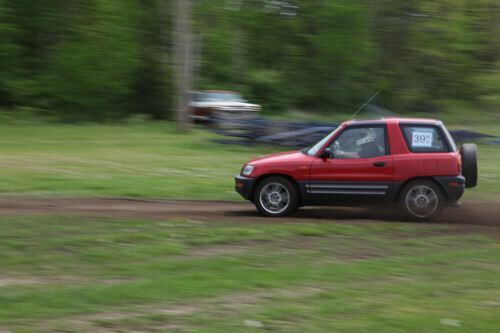 No matter, I felt my friend’s RAV4 was a proper successor to the likes of the Tercel 4WD wagon, Corolla All-Trac wagon and the ’84-’91 Civic wagon. I’m going to channel my inner Zackman here. I HATE that their classification as trucks permits vehicles like this to be sold without a rear bumper. Along with the CRV and maybe others, they have been sold as family cars since their introduction in spite of this inadequacy. I think it was CR that crash tested one. The spare tire did a great job of crumpling the gate and blowing out the rear window. Look how close your children would be to that window, especially in the two-door. Just a little evidence that, for all the whining about gov’t meddling in auto design, it serves a useful function. We’ve come a long way since the 50s but the carmakers will still try to save twelve cents at your expense, if they can get away with it. But let’s give Detroit a little credit – I believe all their small “family” SUVs put the tire inside or underneath, where it belongs. Good point. I remember those tests. I didn’t understand these when they came out. I still don’t see the point. Worthless as a truck, less efficient than a car with similar space. This was not a good trend IMO. Owners of Hummers got a bad reputation for being overly concerned with image and rightfully so, but I think most CUV drivers are the same way. Yup, image and power. And where did all those former Hummer owners go? I’m guessing not to a Prius(though they’re on the other end of the spectrum of image vehicles), more likely into CUV land. Early RAV4s are still quite common around Beaverton. Sunday morning I saw a 2 door driving and a 4 door parked within 2 miles of my house. I am always surprised at how small the 2 door RAV4s are when I see them since my mental image is of something larger. We seriously considered buying one of these in the late 90s but decided not to take on another car loan. I had pretty much forgotten about the two-doors until a guy in the area started rally-crossing one. With a heavily modified turbo engine and AWD it does quite well. Toyota has a bunch of RAV4 EVs, the 1st one, on a lot at their Torrance HQ. I’ve heard they’re still in running condition and used for test purposes. The RAV4 is the best car I’ve ever owned. I had a 2004 model, 4 doors, that I traded in on a 2012. My 2004 had 159,000 miles on it. The new one is a bit larger, but a joy to drive, just as the 2004 model was. 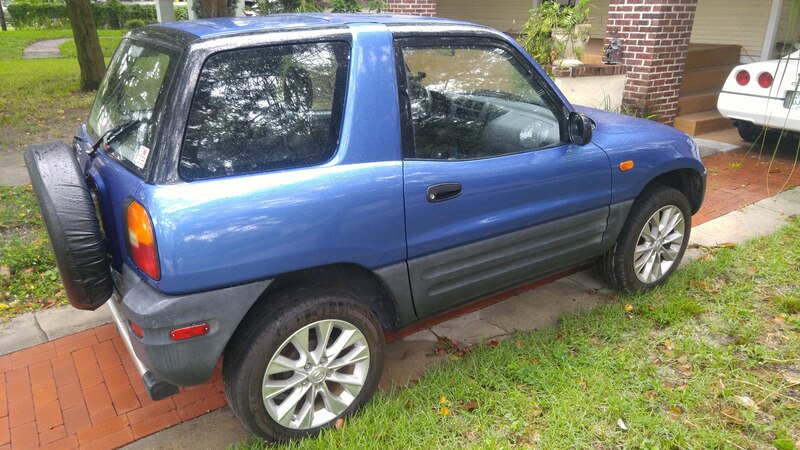 I have a 1994 2-door Rav4 which I adore. It was a display model, has two sunroofs and all the delux equipment. Best car I’ve ever had! Does anyone know if it will be a collectors car in the future? Yes! They’re rare as hen’s teeth and are very iconic looking, so there’s already interest in nice 1st gen 2-doors, and the all wheel drive variants are true unicorns. I should know, I have one too. So tiny with 2 doors but you can still fold all the seats completely flat if you want to camp or catch a Z or two while on a trip. 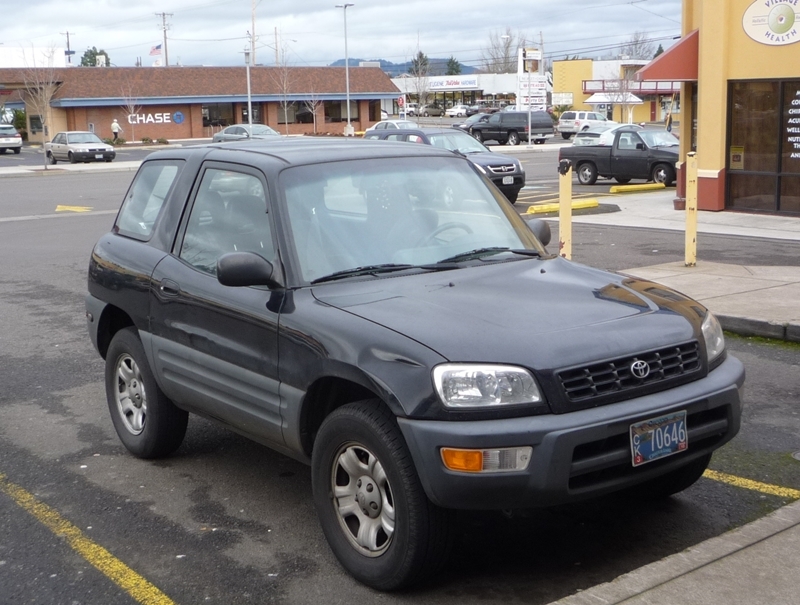 I have a 1997 2-door manual Rav4 in Beaverton. I love my little car! I need to switch to a vehicle with an automatic transmission and I have spread a wide net to locate an automatic version. It seems they were more popular in the eastern part of the US. I searched a long time for a 2 door Automatic AWD…but finally located one. The softtop was shot, so I purchased the hardtop from Rallytops. Love the little SUV.